These are gorgeous! Came packaged well and on time... Love them! Complete the glam look of your living area with this Silver Orchid Olivia end table. Crafted from wood and MDF, the end table features three drawers with beveled mirror panels and drawer fronts with faux crystal rosette knobs. The simple frame and tapered feet are available in a variety of finishes that lend transitional flair to your living space. I ordered two of these. One arrived in perfect condition and the other arrived with some of the mirrored pieces cracked. I called customer service who instructed me to send pictures to another department, so I did. Within the next two days I received another call telling me to send pictures to another department. I did not do this as I had already done as instructed. The next call I received was from a customer service rep who said they were considering the matter to be resolved...it is not. I still have the cracked mirrors on one of my bedside tables, but have grown weary of trying to resolve the matter with customer service. 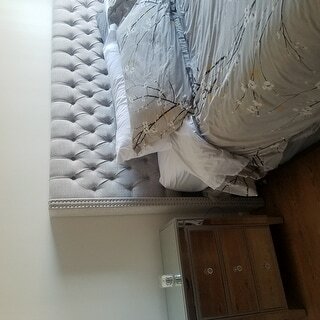 The drawers do glide nicely and they are the perfect size and height for the spaces on either side of my bed. I probably would not order other mirrored pieces to be shipped, but aside from the customer service issue, am pleased with the product. I love them! One of the end tables had a crack but I called overstock and they took care of it by sending me a replacement and the Customer service was great. Shipping was fast also. I love this piece! It was the perfect fit for my new bed. The height is perfect. The drawer space in all three drawers is a fair amount of storage for a nightstand. I have just place the order for my second one as I am so please with the quality and perfect fir in my home. So worth the price! The weather white is not so much white as weather which was perfect for me. This a very beautiful nightstand! It is classy and elegant, with pretty crystal knobs. It's the focal point in my bedroom. Mine came fully assembled, all I had to do was put the knobs on the drawers. I bought the silver one. I love that it has 3 big drawers. I am very happy with my purchase. 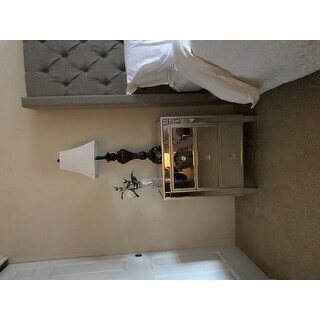 The price was very reasonable and I would recommend this nightstand to anyone who is considering it. The quality is excellent! I love these chests. 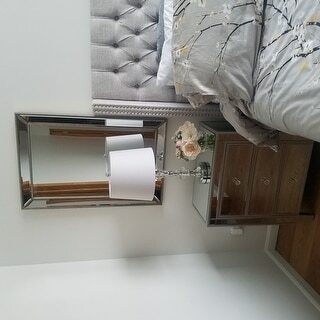 I was debating between the silver and gray because I have a weathered gray mirrored dresser in my room as well, but I’m very happy with the silver contrast. I’m using the chests as nightstands and put nice lamps and a mirror behind the lamps. It really made my bedroom pop, and overstock’s customer service is phenomenal. Two of my knobs aren’t working well, but they’re more on top on getting the drawers replaced than I am. For this price, you cannot go wrong. They’re a win for sure. They look just like the nightstands that cost $800+. Using this as a bedside chest in place of a nightstand. Taller than most nightstands which is what I wanted because our bed has a tall headboard. 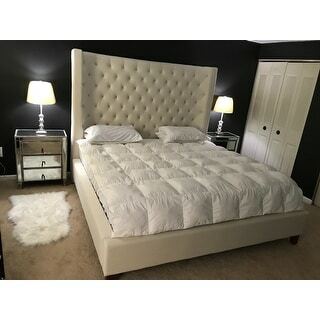 Adds a touch of elegance to the bedroom without being too fancy. Really like the weathered wood accents and the cute glass knobs (which are actually acrylic). I do wish it had drawer guides to allow the drawers to slide more easily. But overall very happy with this purchase! 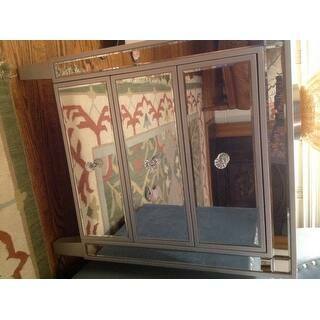 The mirror end table is beautiful, it's also very stunning! 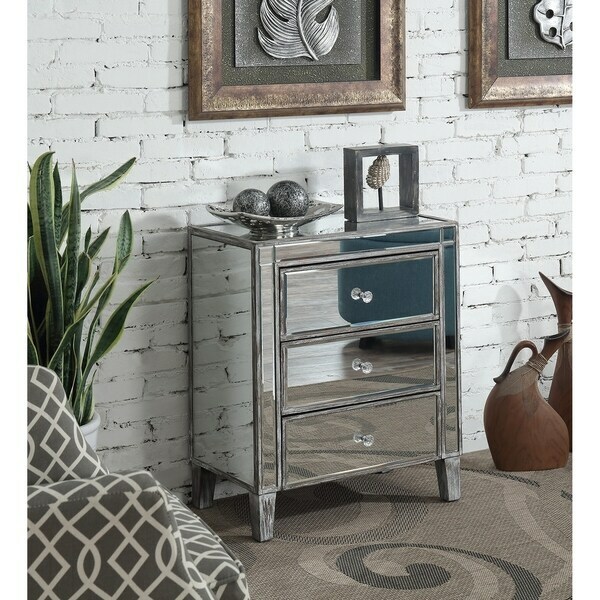 Love my new Silver Orchid Chest, I have it in my family room. I had been looking for something contemporary but not too fancy, the edging around the chest is perfect for making it a little less glam. I also needed more storage thus the 3 drawers! First of all, I was amazed by how fast my nightstands got here! They said that they would arrive on the 7th and I got them on the 4th. 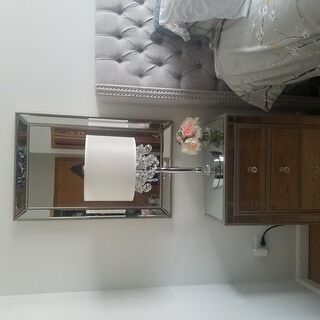 Second of all, these photos on the website do not give these nightstands enough justice... THEY ARE SO MUCH PRETTIER IN PERSON!! Seriously, I literally gasped when I opened up the box! Not a single scratch, crack, or mark was found on either nightstand. I will say that once you first open them up, they do have a strong chemically smell but it goes away after a few hours. All in all, I’m very pleased with my purchase! Thank you, Overstock! I am very please with my nightstands. Love it great buy! 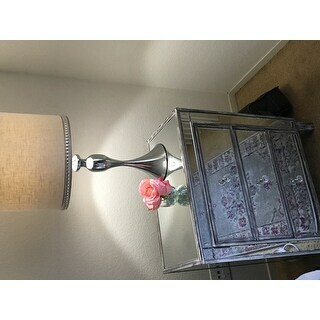 I bought this beautiful nightstand for my bedroom. The shipping was fast. No scratches or cracks on the piece. Today ordered one more. Love it. I really like the look of this end table for my older daughter's room. The only thing I did not like about it was how the drawers glide. 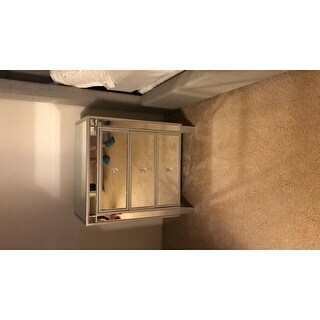 It is wood on wood construction and the drawers are somewhat hard to pull out with even a small amount of items inside. Not sure I would recommend this unless it is for a room that doesn't get used much which is the case for my college age daughter. Exactly what I expected! These are beautiful end tables. I have them on either side of my king-size bed. They are a bit small but I knew that prior by reading one of the previous reviews. I took my chances on them at am very pleased especially given the price. I was nervous they would arrive damaged but they were very well packaged and there was not a single crack in any of the mirrors on either table. Super easy to set up also, all you have to do is attach the knobs. Beautiful end tables. Compliments the headboard. I do like the end table. A little on the cheaper made side but it serves its purpose. Happy with my purchase. Just wish the draws would glide but not a major issue for me. It’s a pretty piece. I bought this for my 8 year old daughter's room. She loves it and it looks great with her pink and teal color scheme. 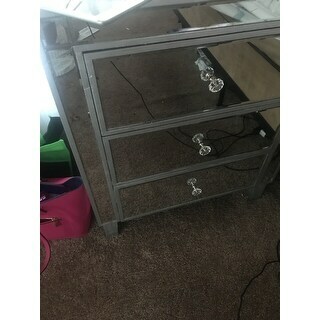 This nightstand looks great in my master bedroom, but the drawers don't have tracks so they don't slide open very smoothly. 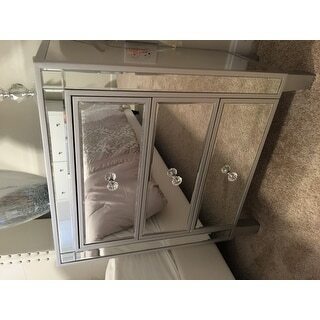 If you are looking for a mirrored nightstand for a great deal, this is it! "How long does it take to assemble?" The only assembly required for this table is to unscrew the knobs found inside the drawer face and screw them to the outside of the drawer face..
"The dimensions are clearly wrong and you don’t know which one is gray or white. According to reviews, the “gray” looks weathered. So what is picture 8 of 9? Silver? There is no option for silver. Fix the height dimension! This needs some clarification! " The two options available are weathered white and weathered gray and they both do have a weathered finish. Pictures 8 and 9 are of the silver option but we are currently out of stock of that color, that is why it is not given as an option. The correct dimensions are height 29", width 24" and depth 14". We apologize for the confusion we might have caused. "Under details it lists the Measurements as 39 inches high x 24 inches wide x 14 inches deep. Under Specs it lists the Dimensions 24.0 In. X 14.0 In. X 29.0 In. but it doesn't state which is height, width or depth. What are the dimensions? This was very confusing. In the space I have, it cannot be wider than 24 inches and I need a height of around 30 inches. Please let me know." This is approximately 28.5 inches high x 24 inches long x 13.25 inches wide. "Is the white table also have a rustic weather look or is it plain white? Can't see a picture of it"
It is a more weathered look. It is extremely attractive. I love mine! I got the silver one. I don't think it looks weathered at all. I love it and. It looks real nice. "What is the height of this peice?" This item measures 24.0 In. W X 14.0 In. D X 29.0 In. H.
"What are the dimensions? Height x Width x Depth "
Dimensions are: 24.0 In. X 14.0 In. X 29.0 In. I hope it helps. "Does the "Grey" color have the wood-like finish or is it solid like one one the photos?" The finish for the grey is weathered.